Those look great! Posts like this make me want to start an army, even though nobody around me plays. I resist... barely. 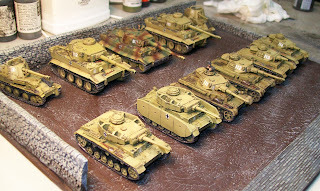 What colour did you use for the denkelgelb and the camo stripes on the tiger? Great work. 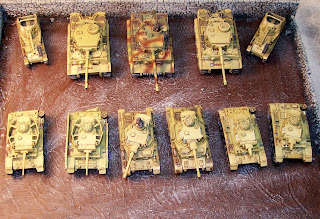 For the dunkelgelb: I used a basecoat of Vallejo Air Model Tank Dark Yellow, followed by VAM Dark Yellow with a final highlight of Dark Yellow mixed with Sand Yellow. Then applied a Mig filter (brown for desert camo). The camo is VAM Tank Brown and a mix of VAM Camo Light Green and Panzer Olive Green. About a 50:50 mix. Thanks. 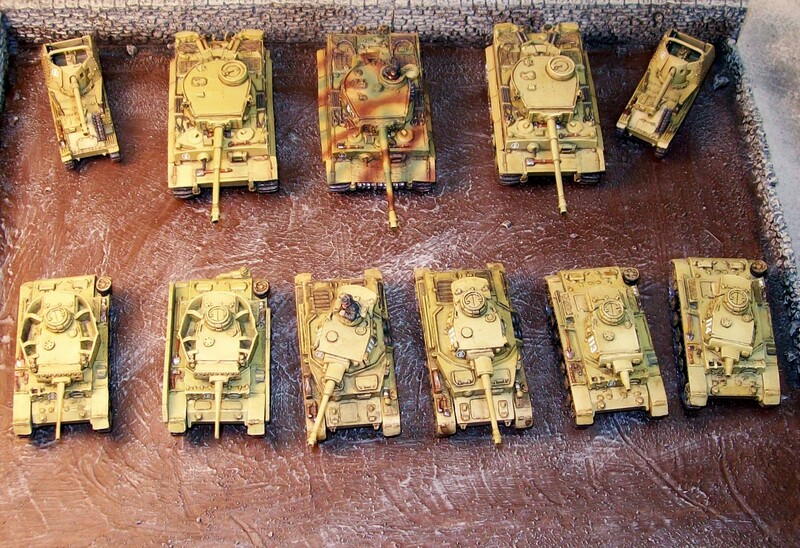 I've been thinning vallejo middlestone and using an airbrush, and haven't gotten results comparable to these tanks. Time to switch to Air Model paints I think. What sets MIG filters apart from, say, citadel washes? Air Model is so much better. I was using Vallejo Model Colours in the airbrush too and they were a pain. Vallejo also makes a thinner you can get in the small 17 ml bottles or a much bigger bottle. I highly recommend it. They also do middlestone in VAM as well if you like the shade. The filters are hard to compare to the washes. They are meant to add depth to flat surfaces but are not meant to shade recessed areas. They have a strong solvent base and the pigments are pretty minimal. I think they could probably be skipped at this scale. They make more of a difference at larger scales. Filters really help smooth out the camo, even at this scale. I personally use "Tan for Panzer Grey" on my Salamander Vehicles. Since my vehicles are basecoated Panzer Grey, it gives them a nice, un-saturated look. I don't know how to explain it. Filters also help make the vehicle look at scale distance. Standing 2-4 feet away, a 1:100 vehicles is a few hundred feet away and the filter I use removes some contrast that you would at the same range.